Take on this fourteen days safari to allow you exposure to the most famous national parks in ugan da that come along with stunning views that are going to sweep you off your feet. You are going to fully engage in the most enjoyable activities during this safari among which is the gorilla trekking in Bwindi impenetrable, hike to the top of Murchison falls, chimp trekking, boat cruise along the kazinga channel and various others. DAY 1: Drive to Sheraton Kampala hotel. DAY 3: Camping at the Top of the Falls. DAY 5: Kibale Forest chimp habituation. DAY 6: Transfer to Queen Elizabeth. DAY 7: Game drive at Queen Elizabeth NP. DAY 9: Gorilla trekking in Bwindi. DAY 11: Transfer to Lake Mburo national park..
DAY 13: Boat cruise and Game drive. DAY 14: Depart for Kampala. You will be picked from the airport incase you arrive late evening you then be transferred to the Sheraton Kampala Hotel for dinner and a night’s sleep. start off your safari with a morning meal at the hotel then you will be picked up by our safari guide to drive to the north west where the park is located with spectacular views all through the way, you will then arrive at the park in time to have your picnic lunch meal with the sight of the top of the falls. After you will head to your camp dinner campfire and overnight rest. Wake to a warm cup of coffee and a snack then head for the morning game drive be assured of seeing various game. Head to the camp after have lunch and engage in the search for more game there after return to the camp freshsen up then enjoy a barbeque dinner plus camp fire while camping at the top of the falls. Following breakfast will be heading to the park headquarters for briefing a then head to the forest to search and know more about the gorillas you will have a short break to have your lunch there after head back to the camp for freshening up then dinner and overnight. Have breakfast in the morning and storm the park for a game search you will see lots of animals not missing out on the tree climbing lions in the ishasha sector of queen Elizabeth national park. You will have your lunch meal and then an afternoon nature walk. After which you will return to the camp for relaxation dinner and overnight. Take breakfast and drive through the rolling hills of this side of the country that is known as the “Switzerland of Africa”, with its terraced hillside that you will be able to see while heading to Bwindi lunch en-route and on arrival at the park check into the park then head to your campsite to have dinner campfire and a night’s rest. Following an early morning breakfast will be making sure you have your packed lunch meal and drinking water then head for the morning briefing which is the first stage to the gorilla trekking activity. You will then head to the forest with ranger guides to search for the gorillas spend an hour of interaction with them and thereafter back to camp for a rest and dinner enjoy the local dances by the locals then sleep. On this day you will have breakfast and then drive to Lake Bunyonyi through the kigezi highlands as you enjoy the beautifully laid scenery. You will have lunch en-route and drive on. You will then arrive at Lake Bunyonyi check in for dinner and overnight.Drive through the Kigezi highlands enjoying the scenery arriving at Bunyonyi by evening. Camp at Lake Bunyonyi. Morning breakfast then drive to Lake Mburo national park through the rolling hills of kabale on arrival have lunch and a swim in the bilhazia free lake as you take on an afternoon relaxation. Head back to your pre-set camp site at the park. You will later have diner and sleep over. 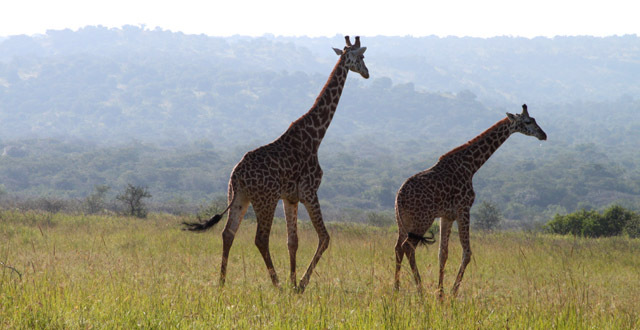 After breakfast, you will head for the early morning game drive that will allow you views of gorgeous game return for a leisurely lunch and then head for a fascinating boat cruise to explore more game and bird life, after which you will head back to lodge for dinner and overnight at Lake Mburo Camp site. Eat your morning meal and depart for Kampala where you will see lots of natural beauties along g the way you will also have your lunch meal along the way arriving in the late check in at the hotel for dinner and overnight at Sheraton Kampala Hotel.